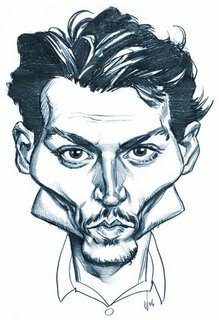 A caricature of movie star Johnny Depp. Not an easy guy to draw but I'm pretty happy with the results. Here's a link to the first attempt. Beautiful job, Chris--great likeness! You really captured him. Unbelievable ... I'm holding my own attempts at caracature up to yours and that sets the bar quite high. And I'll post as time allows. Hey Chris.... uh... hmmm... oh yeah... BLAMMO!... this one is great... you've really captured him in this one.... good job... as always.... PEACE! You are Gosh Dang Gifted Gump! You're right , he's not an easy target. but you captured him in an excellent way! I have never seen anyone catch a whole facial likeness of Johnny as you have here. Are you up to critique? it's the jawbones that don't quite work... to me they don't seem a part of the face...at first I thought they were the collar of his shirt! What media do you use? Do you scan it in? Fabulous work, really. Do you have others we might see? Stingo- I'm always open to criticism. It's a great way to improve one's work.. I see what you're saying. maybe it's a bit too stylised. Connecting the jawline to the chin might integrate it better. Hmmm...might have a little play with it later. Mediawise, I used graphite pencil, scanned and colourized in Photoshop. great job chris, i love your stuff and coming back to check in on your new stuff. great blog. Amazing likeness on both drawings, these are great! todd- Thanks for stopping by. Your work is just magical. dw-Thanks! Really love your inkwork. i recognized him right away, before even reading anything. Your drawings are very great, i love them. 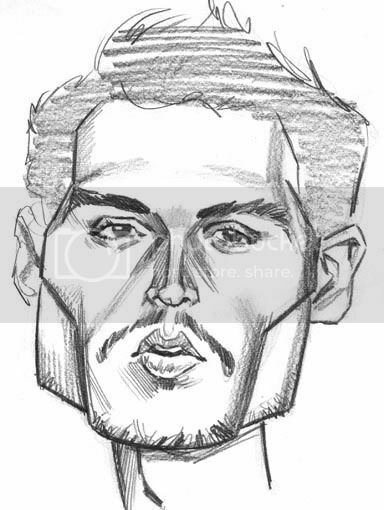 It's funny the more I look at this caricature, the less it looks like him. I guess it's hard for a creator to be content with his own work sometimes. yes, that is true! Very very true. and thanks for your comment..back at my blog:D! Thanks for the comments Makailah!